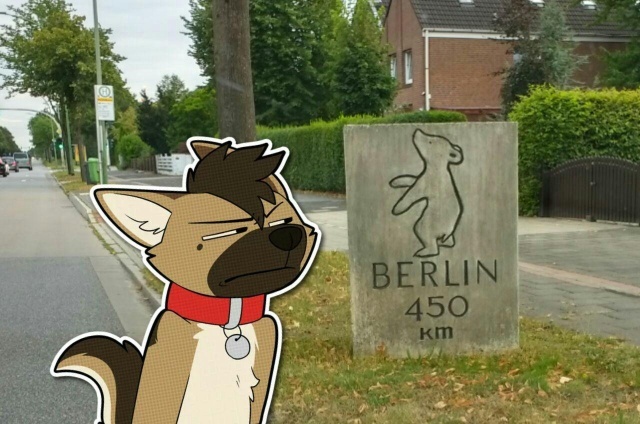 Oh my god, Eurofurence now is a mere three weeks away! Scree! That means it's time for our final drill before you all get stuck in queues, have your flights cancelled, your trains set on fire and your bicycle getting a flat! Boy, isn't travelling fun! Most things that have been mentioned in the earlier posts are things you should have done months ago, so I'll keep this one brief. Don't blame me if you couldn't get to your passport interview at the embassy in time. - Make a packing list for your luggage. Remember to sort out your health insurance if you haven't done so already - visitors from the EU should get a EHIC card from their national insurer, others should get private travel insurance to be on the safe side. A trip to the hospital, for whatever reason, can easily cost you thousands when not insured. Please note that near the A100 / A113 exit AD Grenzallee a diversion is in place until 2019 due to the construction of the new A100 tunnel. 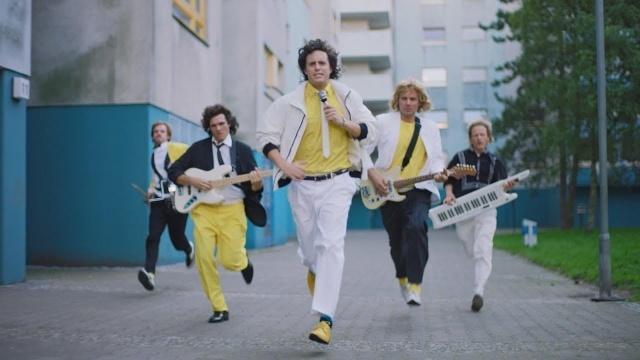 Do remember that the low-emission zone starts just around the corner from the hotel though, so if you feel like driving anywhere within the central districts of Berlin (i.e. you are totally crazy and in dire need of professional help) you will need the appropriate sticker for your vehicle. These stickers can be purchased at a variety of outlets, although it may be a bit too late now to have them shipped abroad. Eurofurence has an exciting new offer for you this year! 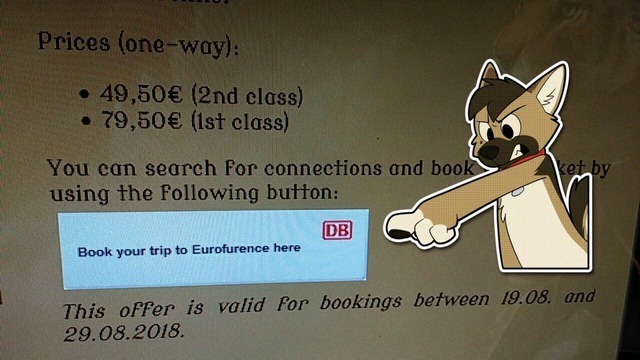 After lengthy negotiation with Deutsche Bahn, which involved several e-mails being sent, we can now offer our very own ticket that even says "Eurofurence" on it! You heard right! ... well, actually we signed up for the DB Veranstaltungsticket (Event Ticket) price plan, which allows you to book both saver tickets as well as flexible tickets for a set rate valid from any German station. Fares are €49.50 per journey in 2nd and €79.50 in 1st class. The offer is bookable exclusively online through the EF web site, where you will find a booking button in the "Travel/Hotel" section. I know nobody ever reads the web site, but in this case you must, as it's the only way to book. Really! The price will remain stable right up until EF, as the contigency allocation works different from other fares. If you plan to make your travel arrangements shortly before the convention, this is a good thing to remember. Ryanair pilots in Germany recently voted in favour of a strike. There is a possibility of industrial action later this month. And with any airline, remember to check your flight plan before departure. There'll be no more updates until the convention except if something major happens, so toodle-pip for now, and see you all at EF, more or less intact.